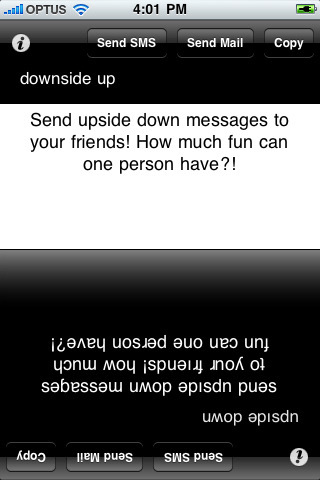 upside down is an iPhone and iPad app from curmi.com that let you type any text and turn into into upside down text instantly. Then you can either copy the upside down text, send it to a friend via SMS text message, or email it to someone. No need to mess around with finding a web tool to do this for you. Now you can mess with your friends with ease. Just type any text you want into the box. Tap Done and watch the bottom of the screen as it shows you the upside down text. The logic in the app is actually quite accurate in producing matching letters upside down, so much so that a friend thought they just flipped the screen around. The only letter that looks awkward upside down is the lowercase L.
– Capitals to lowercase: this will make your uppercase letters into lowercase letters, since they look better upside down. – Windows friendly: If you’re sending to a Windows person, turn on this option to make sure the characters you send them are viewable on their computers. 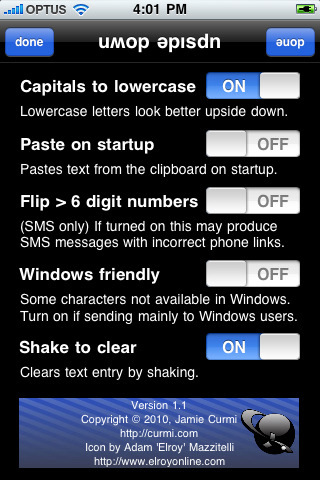 – Shake to clear: Clears the input box by shaking your device. The app works on both the iPad and iPhone. It is free right now for Chinese New Year. Normally it sells for $0.99 so get it now if you can. It’s pretty simple and fun to use and its nice to be able to do it instantly. But in reality how often would you really use this? Get it if you’re curious or plan to use it often, otherwise maybe find an online tool to do the same. AppSafari review of upside down was written by Joe Seifi on February 4th, 2011 and categorized under App Store, Fun. Page viewed 6662 times, 3 so far today. Need help on using these apps? Please read the Help Page.